Today’s K-12 schools are hungry for bandwidth. The reason is clear: highperforming, reliable and easily expanded network services support the latest classroom innovations, including videoconferencing, 1:1 computing, distance learning and modern learning management systems. 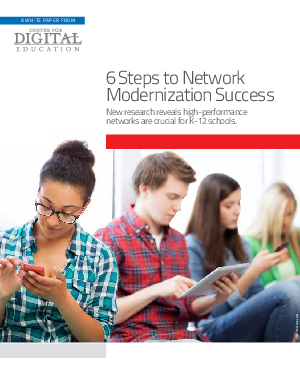 It’s no surprise then that progressive educators now see a direct link between the overall success of their school districts and access to high-capacity networks. This emerged as a clear trend in new research by the Center for Digital Education (CDE) — a commanding 98 percent of administrators and IT representatives said the future of K-12 education hinges on ubiquitous connectivity.